HIFU, High Intensity Focused Ultrasound, Ultherapy, safely lift and tighten the skin. HIFU is a truly remarkable breakthrough in technology, offering a non-invasive alternative to surgery. Known as the non-surgical facelift, the technique can also be used on the body to tighten and lift loose and sagging skin, whilst stimulating new collagen growth. HIFU stands for High Intensity Focused Ultrasound. It uses the power of ultrasound to safely lift and tighten the skin on the face, neck and body. Ultrasound is a form of energy that is significantly different than light such as IPL and Lasers or Electrical (Radio-Frequency) energy. HIFU protects the skin surface whilst precisely penetrating at deeper levels and higher temperatures than Radio Frequency for example, treating beyond the dermis and foundation layers of the skin, where structural weakening starts. The aim of HIFU is to target energy into the deep, structural tissues and muscles, restoring collagen and creating a tightening effect. Gradually the skin and tissue memory is revived. HIFU safely destroys tissue via a process called coagulative necrosis, which is when heat produced from the ultrasound is absorbed into the tissue. The tissue is heated to an optimal temperature between 65-70 degrees and a focused energy at 4.5 and 3.0 mm depths bypasses the uppermost layer of skin. 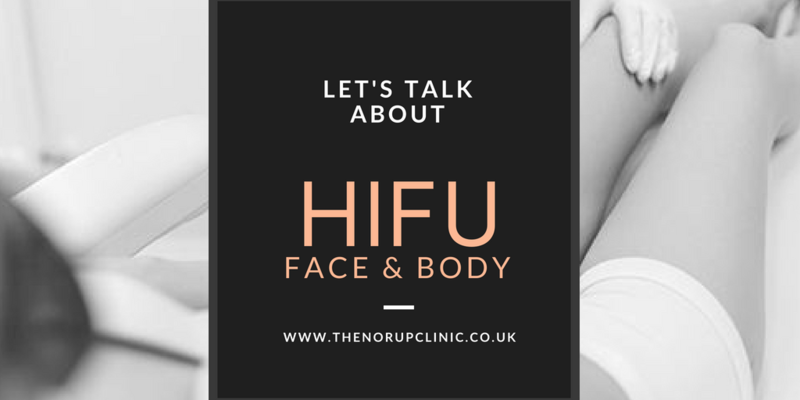 When HIFU is used on the body it works to destroy the fat cells by targeting the fat directly and then the body naturally removes the eradicated fat via your liver due to natural lymphatic circulation, giving one a more contoured, thinner and tighter skin in the area treated. Gel is applied to the area that is to be treated and the ultrasonic device is passed over the skin. A single area can take 30-40 minutes, whereas a full face and neck treatment can take up to 90 minutes. For the face, results don’t tend to show until 2-8 weeks after the treatment and the treatment itself can last from 6 months to 1-2 years. Please note that factors such as lifestyle, age and diet can affect how long the treatment lasts. What are the Most Common Areas People use HIFU On? TheFreeDictionary.com. (2018). HIFU. [online] Available at: https://acronyms.thefreedictionary.com/HIFU [Accessed 29 Jul. 2018]. Park, H., Kim, E., Kim, J., Ro, Y. and Ko, J. (2015). High-Intensity Focused Ultrasound for the Treatment of Wrinkles and Skin Laxity in Seven Different Facial Areas. [online] NCBI. Available at: https://www.ncbi.nlm.nih.gov/pmc/articles/PMC4695420/ [Accessed 29 Jul. 2018].